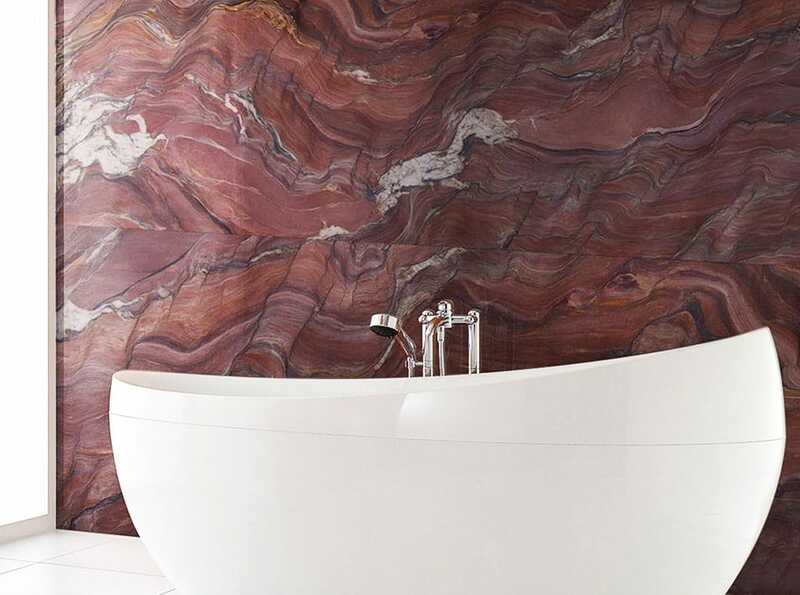 Outstanding marble walls confer a unique accent to any architectural space. Until now marble cladding has been restricted to limited applications. It is used especially in areas such as bathrooms where along with the aesthetic importance the practical value of the material is appreciated. 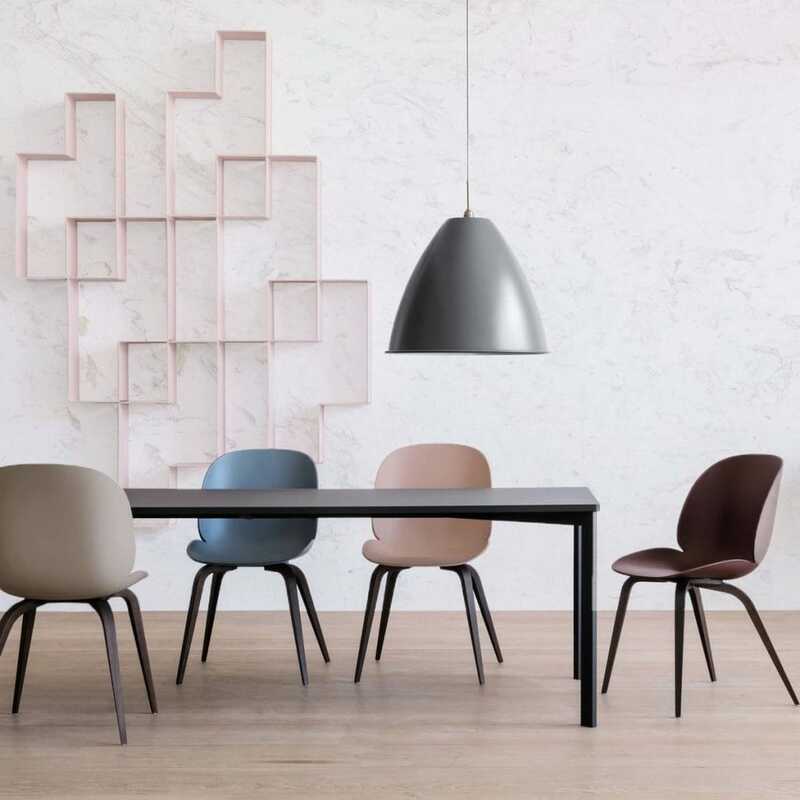 Nowadays, renowned interior designers take these applications out of their context and use them in less common areas with a merely aesthetic purpose. Highlighting one of the walls of a room, differentiating it from the rest with regards to color, texture, and material is a trend in interior design. Today, this creative resource can be realized thanks to better access to exotic and unique stones from anywhere in the world. In this way, marble becomes an authentic and expressive canvas and in many occasions captures all the protagonism of the style within the space. TINO Natural Stone has participated in some projects with outstanding marble walls and has also made some design proposals. Let’s take a look at some examples. When immersed in this modern bathtub we think of the ocean, a visual experience that accompanies the ritual of a good relaxing bath. 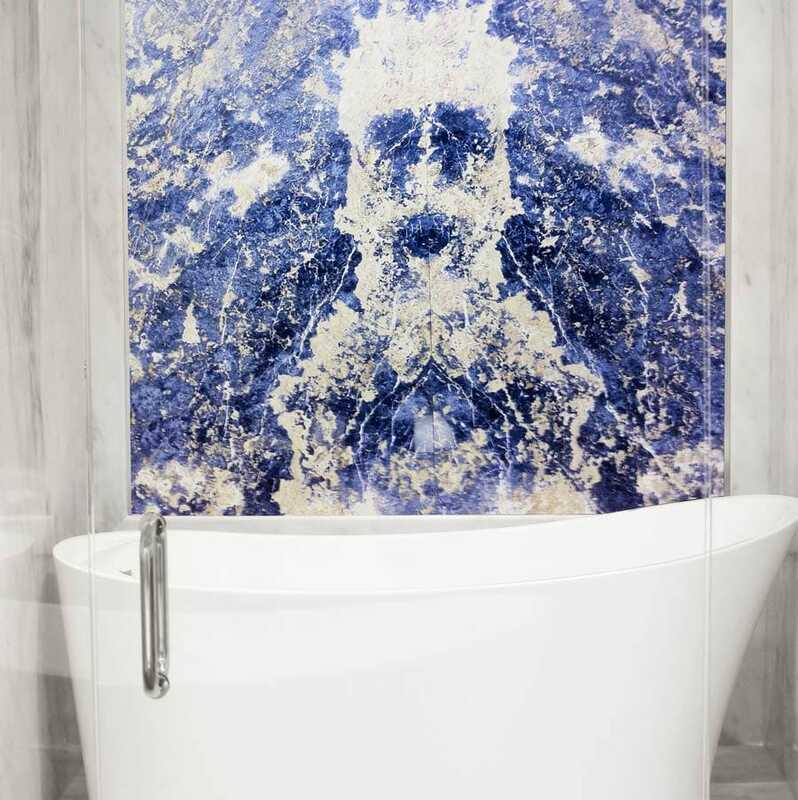 The highlighted wall is composed of a blue marble called Blue Sodalite Blue. The calcite contributes the white of the veins, that as we see in the image, resembles the spray of the sea. The pyrite, on the other hand, adorns the waves with soft golden reflections. Onyx is considered a semi-precious stone. The arrangement of the plates enhances the waters of this variety belonging to the agate family according to the book-match technique. 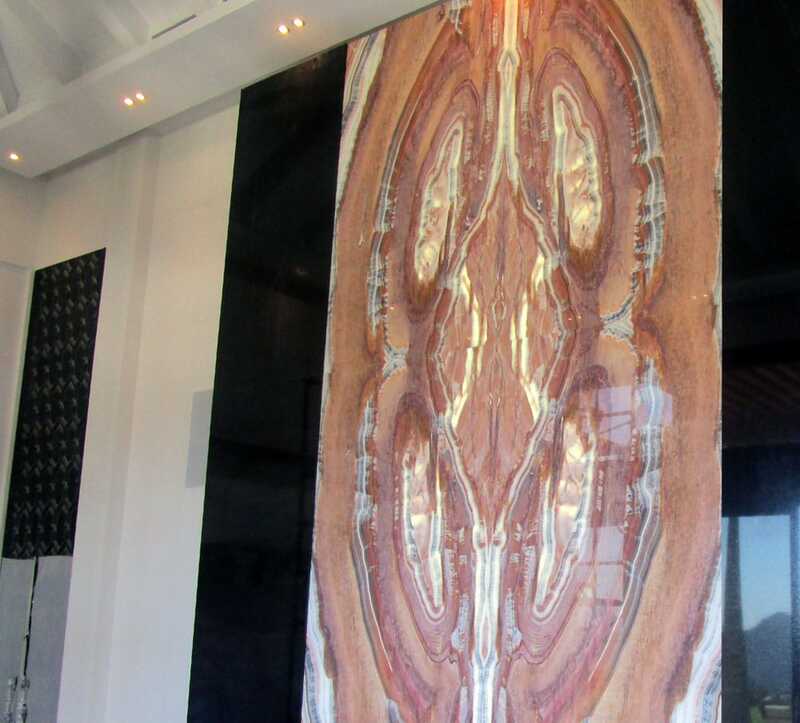 This Orange Onyx jewel wall presides over one of the lounges of a luxury villa in Marbella in which natural materials are a priority. The design of the stone resembles a sizeable millenary trunk, bringing a charming and very enigmatic character to the space. 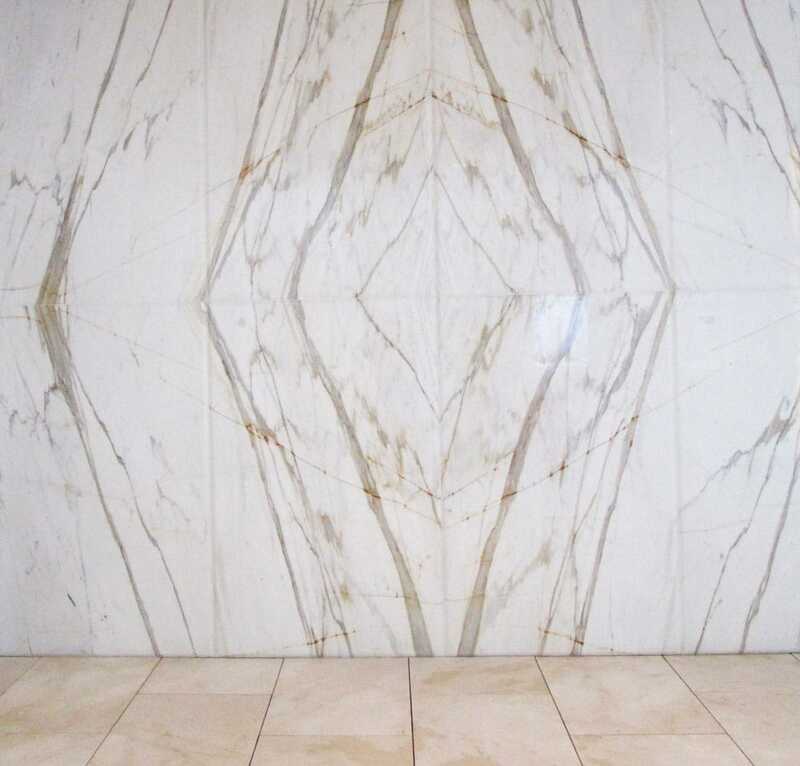 Also starting from a book-match layout, this wall of Calacatta is a work of art in itself. An elegant grey veinage, surrounded by little amber glazes, furrows the splendid broken white base of one of Italy’s most emblematic marbles. The designer has done an excellent job of enhancing the whimsical geometry of nature. We return to Orange Onyx to illustrate how the jewel wall option brings personality and sophistication also in a public space. 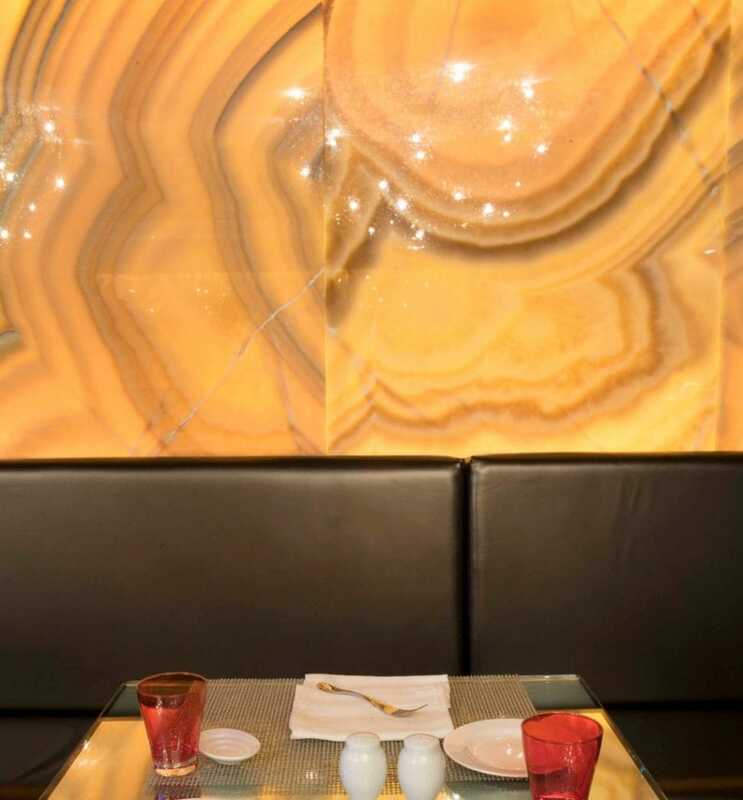 As if it were a mirror, on the onyx surface you can see the reflection of the lights, causing the appearance of sparkles in the stone — a magical setting ideal for an unforgettable dinner. If we talk about luxury in the hotel sector, we inevitably have to visit the Bulgari Hotel in London. TINO Natural Stone participated by applying Green Onyx, Grey Osiris, and black marble in Spa and bathrooms. In the image above we see an area of the Spa that becomes a unique and magical space for relaxation and wellness. 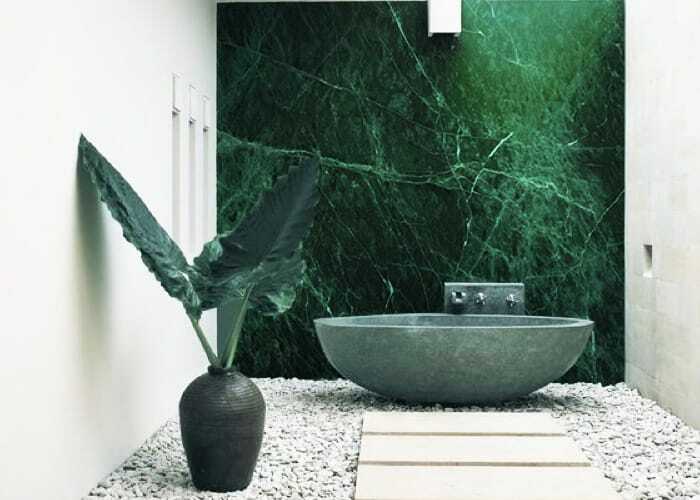 The spectacular and enveloping highlighted Green Onyx wall gives a unique charm to the bathroom. Above, we see a clear example of what we mentioned at the beginning about how to take the marble out of context and out of any practical function. The wall of the headboard of the bed turned into a great piece in perfect harmony with the whole. A natural canvas turned into a work of art that gives personality to a space of refined and cold forms a priori. 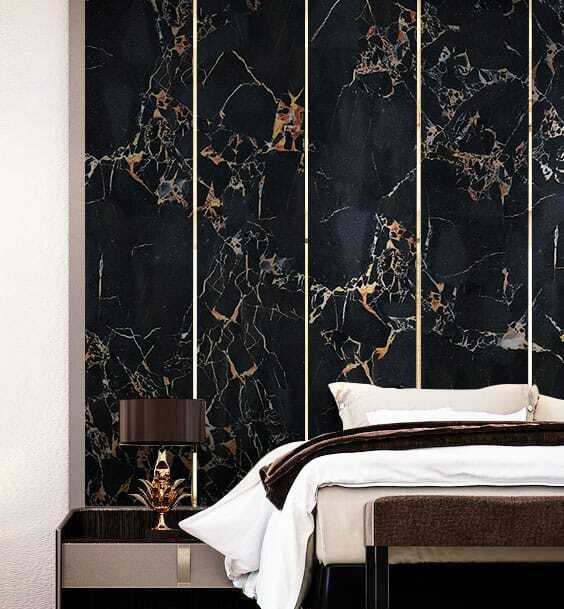 This other image shows a jewel wall formed by several Portoro plates; a high-end black marble considered the most expensive marble in the world. 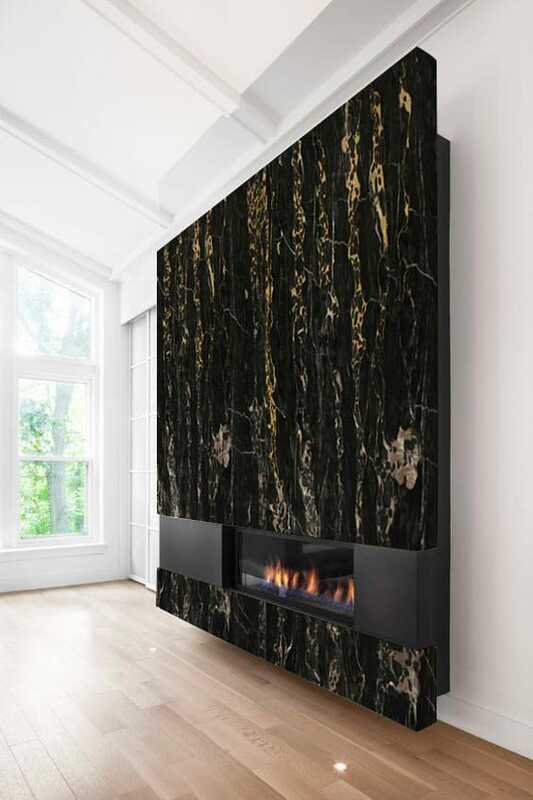 The crystalline deep black base is furrowed by a spectacular burst of golden veins and white effervescence. Another space in which current interior design trends have given value to marble, but from a very contemporary renewed vision, is the front of the chimneys. 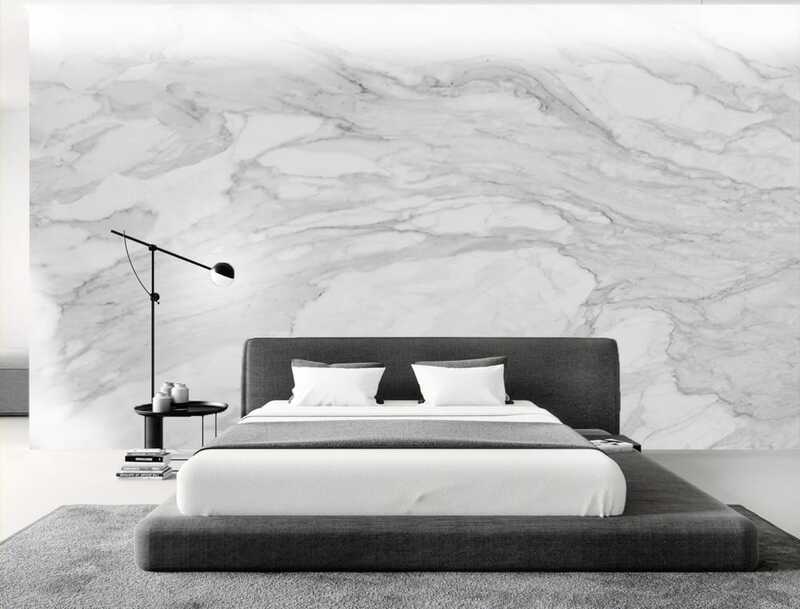 Here the Portoro black marble becomes the protagonist element of the room. 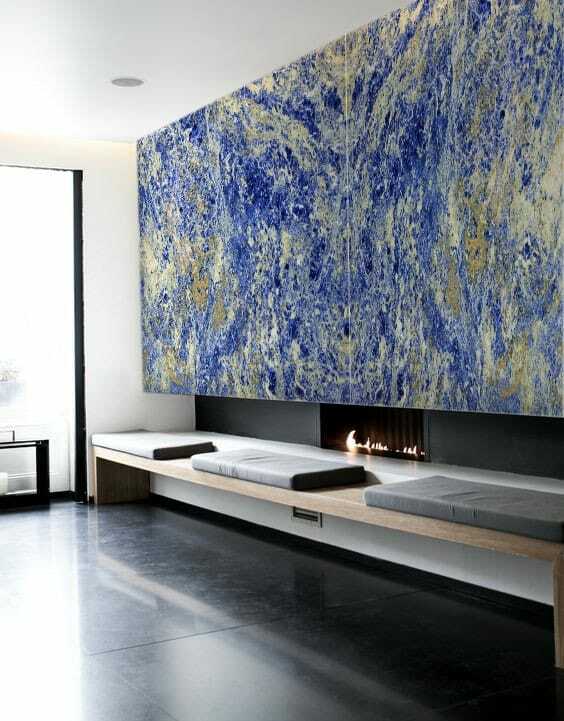 Another option to decorate the main wall with a fireplace is to cover it with Blue Sodalite. 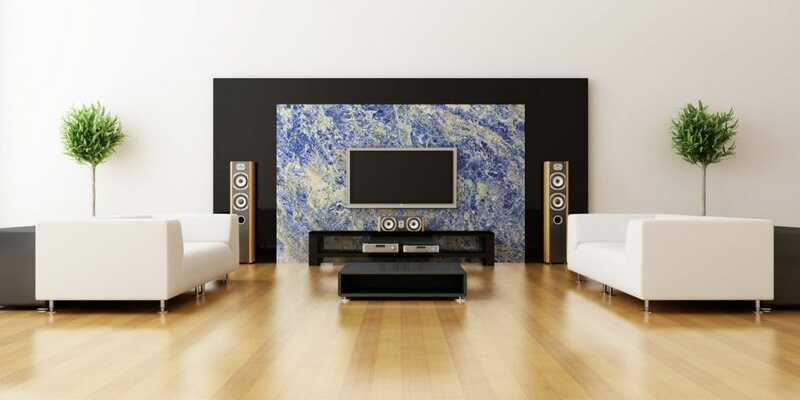 Varieties of exotic marble such as again the Blue Sodalite can also work to create the ideal frame for the main elements of the room. In this example, the stone enhances the audiovisual devices of the room. 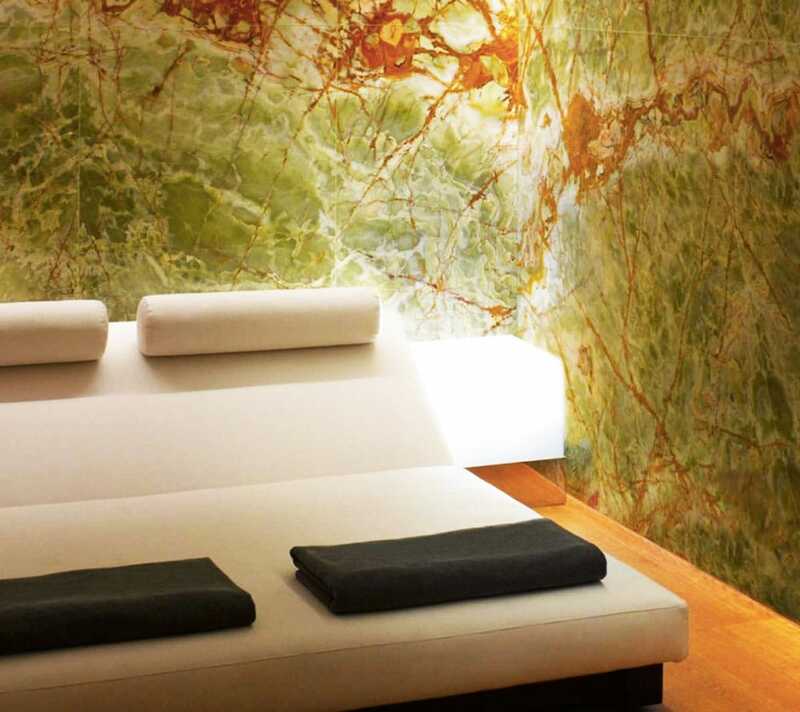 Rooms as crucial as the dining room or a meeting room can also house a prominent marble wall. In this case, we propose Blanco Atenea. Thanks to its beautiful white base and the softness of its grey veins, it can frame any type and style of furniture. As we have already seen above, a good option to show off an outstanding marble wall is to apply it on one side of an exempt bath. It works very well with contemporary styles of simple and clean lines. Finally, we show an idea for covering spaces such as porches or semi-covered outdoor jacuzzis. On a very sober white space, the chromatic richness of Guatemala Green stands out. It is a serpentine green marble whose deep green sprouts bright white veins that transport us to the landscape of mangroves and tropical forests. Undoubtedly, exoticism in its pure state.